I received Crochet Learn It. Love It. By Tracey Todhunter to review. As most of my readers already know I love crochet, so I couldn’t wait to review this book. I have to say before I explain any further, if you are looking for a comprehensive beginners guide to crochet then this is definitely it! The book contains a mix of essential crochet skills, patterns, tricks and tips to ease you into a life of learning and loving crochet! Essential Skills covers everything you need to know starting with different yarn types and weight. I was pleased to see a Ball Band explanation, something I haven’t seen anywhere else before. With different types of hooks available, basic accessories and even luxury accessories explained, any beginner is sure to feel knowledgeable. This handy book shows you all the essentials from holding and tensioning the yarn via various methods. It also shows you how to hold the hook, make a slip knot, foundation chain, count chains, work into chains and fasten off. All explained in great detail, accompanied by photos making it easy for any beginner to learn Crochet. There is a great guide to basic stitches which will help you get started on most projects. To make this easier there is a full explanation on how to understand crochet stitches to help you make sense of your work and pick up on any mistakes, a huge help for any beginner. I remember looking at my first crochet attempts and having no idea what I was looking at or if it was correct. This book puts your mind at ease as you learn making it much more enjoyable. Crochet Learn It. Love It makes reading patterns and charts a breeze and explains measuring AND adjusting your tension! From joining yarn to working neat stripes, stripes with a difference and shaping your work, you’ll feel like a pro in no time. You’ll find yourself knowing how to finish your work, different blocking methods, tapestry needle stitches, crocheted, slip stitch and conceal crocheted seams enhancing your work. I’ve been crocheting at least 2 years now and I had already learned so much from this book, without even passing this first section! There are several quick start projects throughout the book. These consist of quick and easy patterns which require little yarn. Each project states the finished size and tension along with the items you’ll need. These are items such as yarns, crochet hook sizes, yarn needles, buttons etc. There is also a list of abbreviations and techniques used in the pattern along with the page no within the book to help you with stitches. Following pattern notes you can find the pattern itself with photo’s to guide you. Compared to other crochet books I’ve read I genuinely felt that I could try each project. This would have been perfect when I first started out. With such great explanations and notes you are filled with confidence to complete each project. I’ll definitely be making a few of these once I’m done with my current Crochet Projects! Moving on to the second section you quickly learn how to work in the round. Learn the foundation ring, magic ring and finger wrap methods to start. This section will quickly show you how to crochet circles and spirals along with a gorgeous ‘sun in the center’ pattern to show off your new crochet skills! Blocks and motifs are great for making various pieces and are also worked in the round. This books explains how to make a plain granny square block, granny motif, granny triangles and granny hexagons. These are useful from cushion covers, blankets, cardigans and more. You will also learn to crochet a circle or flower in a square. There’s a lovely pattern at the end of this section for a granny square cushion similar to the one I recently made too. I love granny squares as they are nice and easy but I decided to try a granny triangle for the first time. I found the pattern easy to follow and can now tick it off my list of things to learn! Stitch variations really can change crochet, from working into just a front or back loop, extended stitches and alternate loops, this book covers it all. This is something I hadn’t found in my other books either and Tracey Todhunter explains it all so well. I was surprised to find so many beautiful stitches and patterns to go with each stitch enabling you to create impressive crocheted pieces instantly! It really is quite an extensive list for a beginners guide and will no doubt make falling in love much easier. Finishing touches such as buttons, holes, edging stitches and more are explained in great details with some fantastic techniques shared. Whether finishing crochet work or adding a touch of crochet to a pillowcase or similar, you can use these finishing touches to pretty up just about anything! Each section is bursting with enough crochet knowledge that you feel confident taking on new projects. I may not be a complete beginner but I still learned a good few tips and stitches. The patterns throughout are simple to follow and will have you falling in love with crochet in no time! The Final chapter shows you a few more advanced skills such as tunisian, broomstick and hairpin crochet. I will be attempting the Tunisian at some point as this guide looks much easier than other’s I’ve looked at. Detailed step by step photos with explanations make each technique seem doable. Honestly, Crochet Learn It. Love It. is a fantastic guide to crochet and makes it so easy to learn, you really will love it! You can learn so much from this fab little book and I know I’ll be using it for reference in future. There are a good few stitches in the book I’ve yet to try. I can’t wait to speed through my current projects and try them. Part 2 of my Purple Crocheted Summer Cardigan is finally here! Yes, that’s right, after far too long, I finally finished! You may remember Part 1 when Ritohobby kindly sent me some of their gorgeous Infinity Hearts Rose 8/4 yearn to create this cardigan with. I loved this project so much but being a much thinner yarn and using the purple 3mm hook began to cause excruciating hand pain. After just 5 minutes of crocheting I’d begin getting sharp pains and after 10-15 minutes, I just couldn’t continue. This led to me crocheting in very small spurts and not overly looking forward to it. I did manage to slowly make progress, but each sleeve took a month. I began getting quite stressed about the delay to part two of my post which unfortunately Checka heard all about! After getting fed up with my moaning she kindly treated me to some new crochet hooks with much more ergonomic handles. I was quite overwhelmed, to be honest, crochet has helped me so much until this point because it was the only body part that didn’t hurt! Pain slowing me down had been really hard to cope with. As soon as my new hooks arrived I got to work again, completing the final piece of a sleeve, hem and beginning the hood. With a better hook, this yarn began to work up even quicker than before too. The Infinity Hearts Rose 8/4 yarn is gorgeous to work with and the colour still amazes me. I’m a little sad not to be working with this yarn any longer. I am however very pleased to be adding this cardigan to my wardrobe! Originally meant to be a summer cardigan, it is one I can see me wearing year round too. 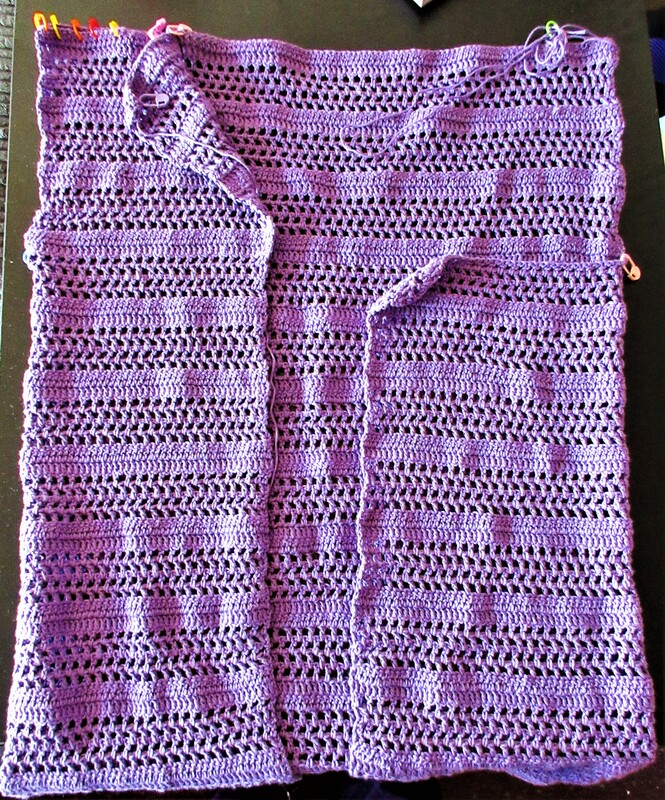 So what do you think of the completed purple crocheted summer cardigan? Mental health benefits of crafting ranges from stress relief to a sense of achievement. There are several benefits of crafting, something I have written about before. I especially find crochet relaxing. Having anxiety, depression, PTSD and chronic pain (peripheral neuropathy) is hard work, focusing on a small craft project can be really beneficial. Over the last few years, I’ve realised crafting is so much more than a hobby for me. It’s a stress reliever, a way to escape, a way to quieten my brain whilst I’m ‘in the zone’. For someone who struggles to go out and can’t work, it gives me a sense of achievement I otherwise lack. With low self-esteem and confidence crafting gives me a huge boost! I encourage the girls to craft too as I know there are so many benefits. You’re are never too young to look after your mental health, a day at school can be stressful and crafting is great for winding down. I’ve teamed up with BestFabricStore.com to share the infographic below highlighting the many mental health benefits of crafting. 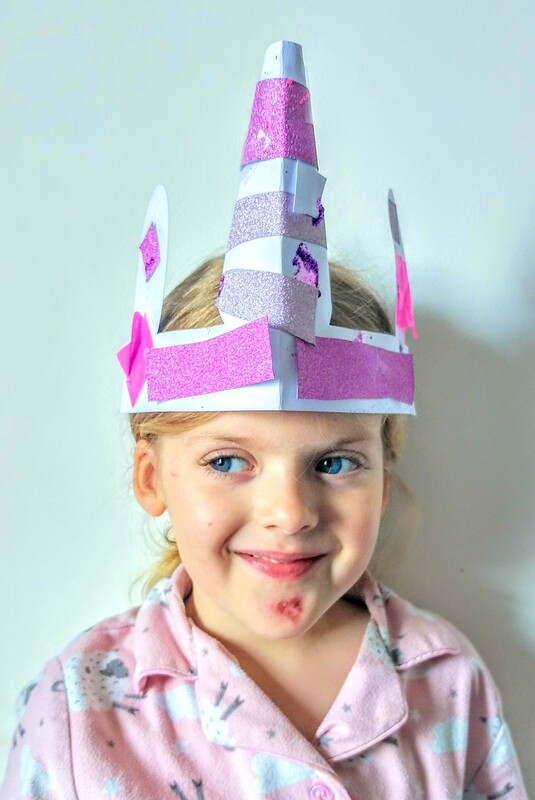 Anyone that follows my blog will know I craft most days, whether it’s crocheting blankets, drawing with the girls, crafting Cardboard box dragons, I even learnt to make a felt woodland garland last year! The Mr, having realised how much blogging & crafting is beneficial to me has encouraged me to create my own workspace too. It’s made crafting, writing and storing things so much easier. Especially as the cold weather closes in rapidly on us, crafting can turn dull days into something positive. You can turn your mood around completely by working on a craft you enjoy. From painting, drawing, crochet, knitting, paper engineering, sewing and countless other crafts, there is something for everyone. Do you craft to benefit your mental health too? What is your go to craft? 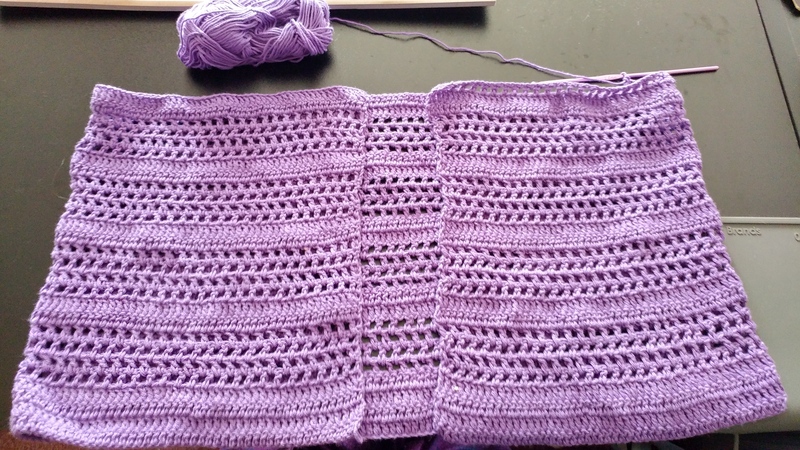 I’ve been creating a purple crocheted summer cardigan using yarn from Ritohobby. Summer may be over but this purple crocheted summer cardigan will be perfect for next year. 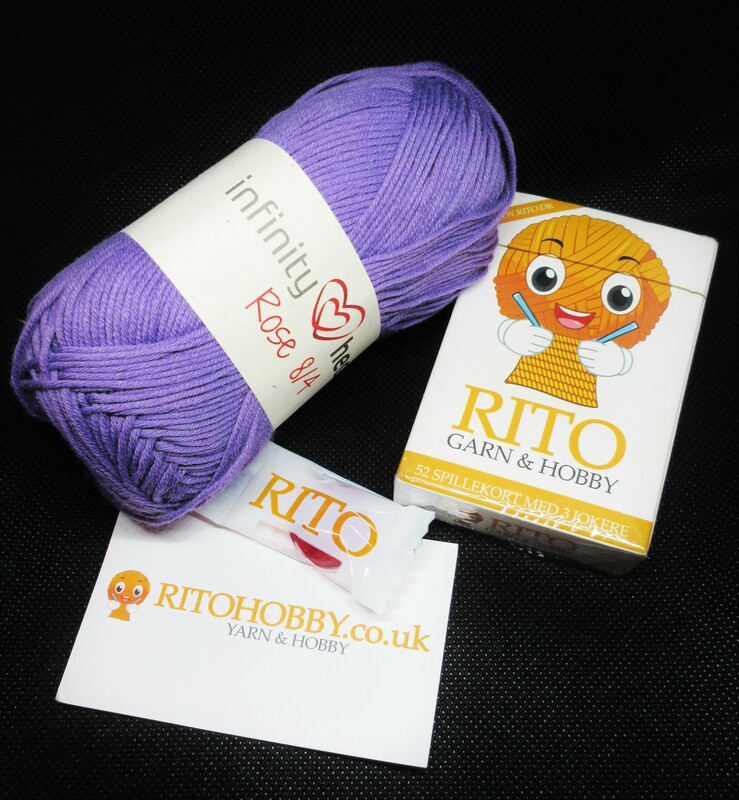 Ritohobby is a Danish company supplying yarn & hobby products who have recently launched in the UK too. 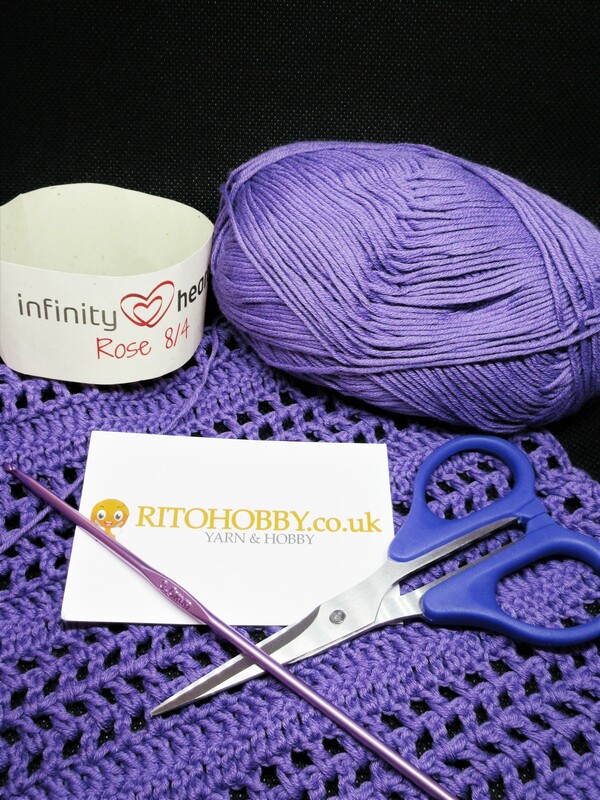 I was sent the gorgeous Infinity Hearts Rose 8/4 yarn in purple to try out. This yarn is 100% cotton, it’s much thinner than the yarn I used for Eva’s Rainbow Unicorn Hoody. I was looking for yarn more like this for that project so I will be ordering more soon! The shade of purple I received is gorgeous and will look lovely with the outfit I wanted to team it with (Jean shorts and a vest top). As always, this project is taking longer than expected, forgetting that the summer holidays meant a lot more tidying! Creating the design myself using stitches I already know, I’ve worked on it over the summer and slowly getting close to finishing. I’m hoping to work much quicker with Izzy starting school tomorrow! I wanted something light but warm, living near a river means even on the hottest days we can sometimes get quite a breeze. Whilst summer is over, this will be great for indoors on those warmer days. I’m pleased with how this yarn works up, it looks lovely and feels lovely. I decided on a pattern I liked the idea of and got started. Similar to Eva’s rainbow unicorn hoody, the main body is worked as one piece until the armholes. I wear a size 8-10 cardigan so this is the sizing I’m going with. Whilst I have been slow with this project, the end is nearing! I just have a front panel, sleeves, hood & hem to complete. I’m really happy with how this is turning out and I absolutely love the Infinity hearts rose 8/4 yarn from Ritohobby. I will definitely be a regular customer with Ritohobby! What do you think so far? Have you heard of Ritohobby before?